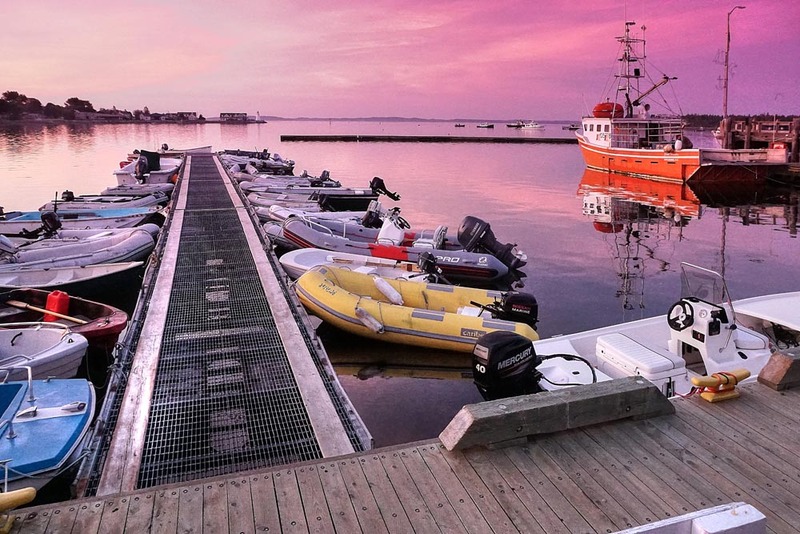 St. Andrews Market Wharf is operated by the Town of Saint Andrews, and welcomes visiting boaters. Whale watching tour operators and fishing boats also use the wharf, making it a bustling place. 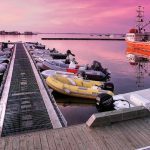 Moorings are available for rent and limited dockside space can be reserved ahead. No fuel is available at wharf, but there is a gas station 8 blocks from the wharf, and a wagon to haul jerry cans (which are available if needed). Nearest fuel dock is Eastport, Maine. The Wharf is located in the heart of a tourist area with shopping and restaurants an easy walk away. 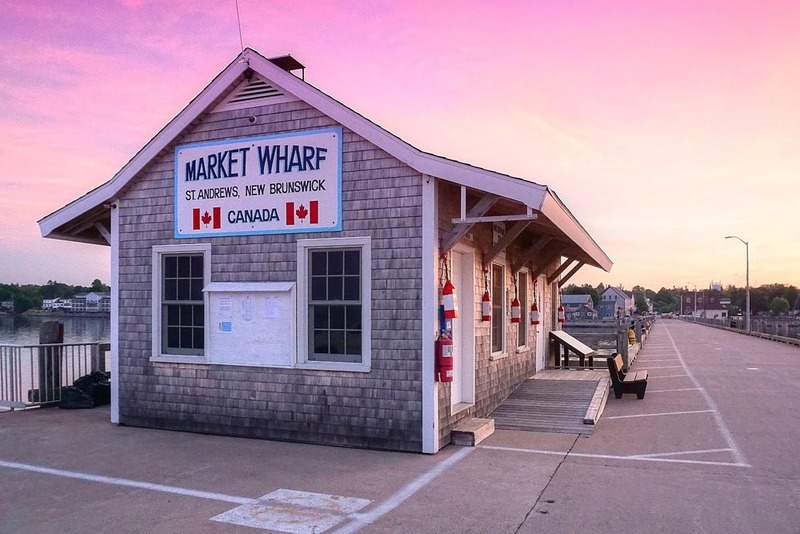 There is a bank, hardware store, drug store, laundromat and grocery store within a block of the wharf and the liquor store is just a few blocks west. At low water, moorings are 14 ft. depths, the front wharf varies from 9 to 13 ft. along the outer face. With the 24 ft. tidal range, anchoring needs plenty of scope, and if the harbour is crowded, a mooring is recommended. Boats are often met by the wharfinger and directed to available rental moorings, which are distinct blue mooring balls. If you arrive late, just pick up a blue mooring and check in with the wharfinger the next morning. Moorings farther from the wharf are quieter as there can be whale watching boat traffic coming and going. Most of the moorings in the harbour are privately owned, and you will find local boaters happy to welcome visitors and answer questions. 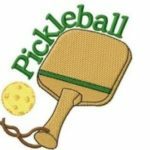 Coming in from the United States? Canada Customs can be reached by phone at 1-888-Can-Pass toll free (1-888-226-7277) if you are arriving from the United States. 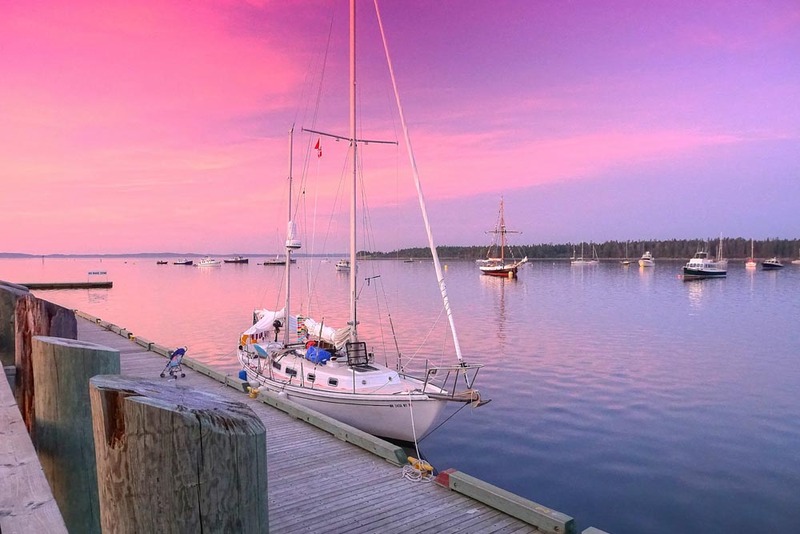 Eastport Maine is a 2 hours sail away for clearing into the US when leaving Canadian waters. 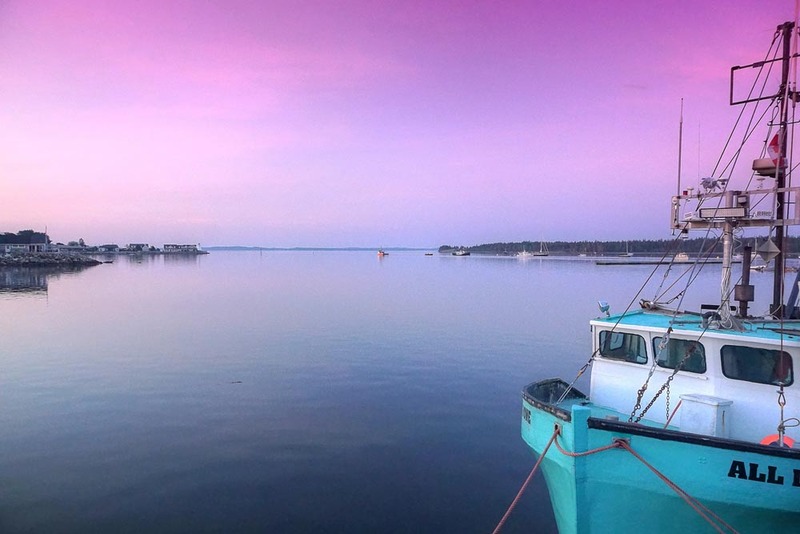 St. Andrews Harbour is tucked behind Navy Island within Passamaquoddy Bay. 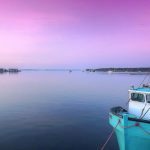 Sheltered from both rough seas and fog by Deer Island, Passamaquoddy Bay provides a wonderful area to cruisers. 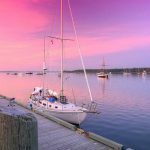 Only two hours from Eastport Maine, St. Andrews is often the first port of call when entering Canada from US waters. With a 24 ft. tidal range in this area it is important to work with the tides. L’Etete Passage: tide can run up to 5 knots through this passage, so it is best to come in on slack tide (at high or low tide as it is turning) or as most local boaters do, come through with the tide. It can be a little turbulent, but the push of the current speeds passage. There are two ferries running between Deer Island and L’Etite every half hour, They monitor VHF channel 14 and use AIS signal. 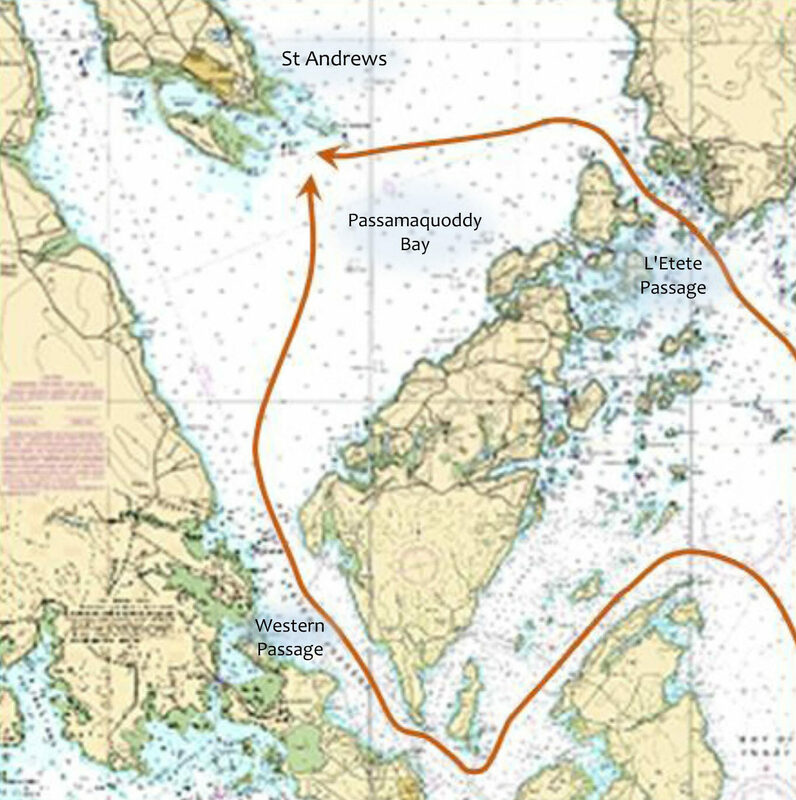 Head Harbour Passage/ Western Passage: tides run 2 – 3 knots making this an easier, but slightly longer route along the inside of Campobello Island, past Eastport, Maine and around the western end of Deer Island into Passamaquoddy Bay. If you are waiting for a favourable tide, Head Harbour on Campobello Island, N.B. is a scenic Canadian stop. Local whale watch boats monitor VHF channel 78 if you want to check out whale activity in the area. Once you have entered the Passamaquoddy Bay from either Western Passage or Big L’Etete Passage you can navigate to the SX3 green bell buoy that marks the entrance to the eastern St. Andrews Channel. Once at SX3 you can be guided by the red and green buoys into St. Andrews harbour. It is well marked, with a low water depth of 9 ft. at the narrowest part near the harbour lighthouse.